It was a quiet Fire & Wine night this week. Mr. Quirky met the boys to hang out and do nerd things. And we had no special guests. Just the three of us girls…. 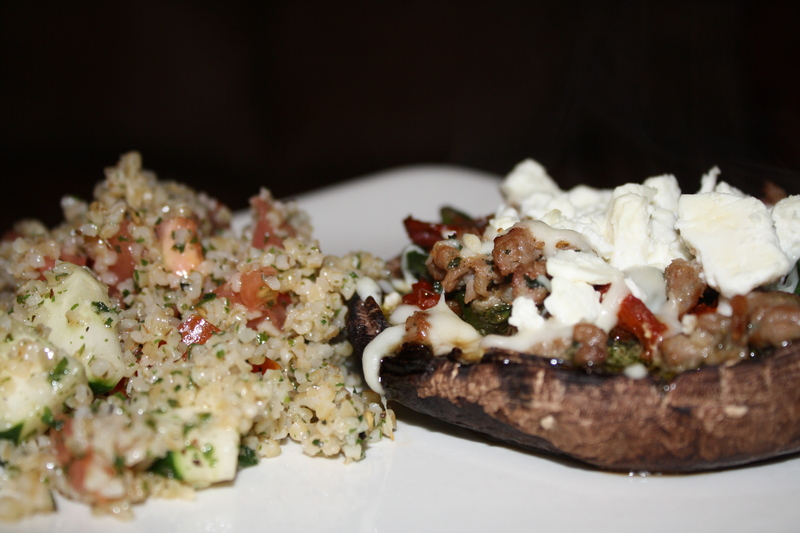 The Mediterranean portabella pizzas were the bomb diggity. Yes. Diggity. I blatantly stole the concept from one of my favorite pizzas over at Kansas City Minksy’s Pizza. Their Mediterranean pizza sports lamb sausage, pesto, sun-dried tomatoes, spinach and a mix of feta and mozzarella cheeses. Well Minsky’s, love you and all, but I’ll take your doughy crust and raise you portabella mushrooms as the vessel for delicious toppings. 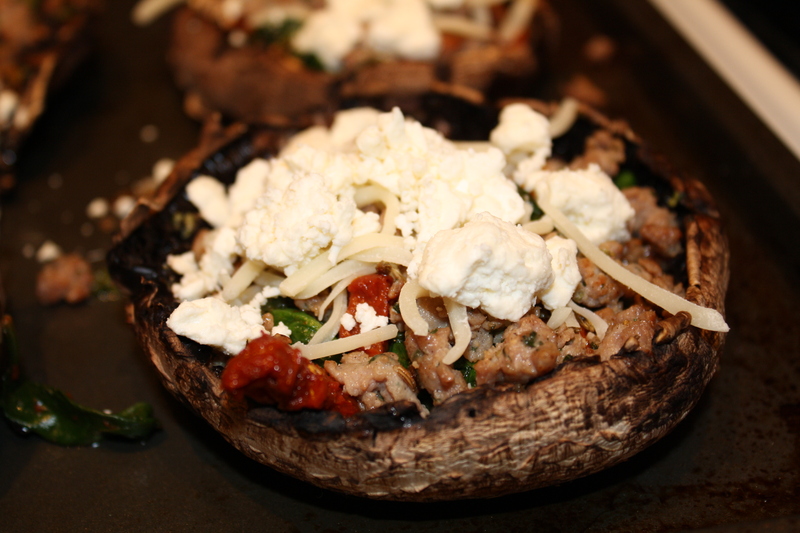 My mushrooms were dressed up in their Sunday best: walnut pesto, sun-dried tomatoes, spinach, turkey Italian sausage and a mix of feta and mozzarella cheeses. And as if these decadent pizzas weren’t enough for our spoiled little tummies, we decided to make an ice cream run to a local Quick Trip to pick up my favorite pint of Ben & Jerry’s. But if you dare call me a chunky monkey…no recipes for you! Pulse basil leaves to chop. Then add walnuts and garlic. Pulse until ground. Pour in olive oil, pulsing to blend until desired texture has been reached. Salt to taste. If your sun-dried tomatoes aren’t already chopped (I purchased mine that way), you’ll want to cut into strips. Heat wine in microwave for 30-45 seconds. Add the tomatoes to wine to rehydrate and allow 30 minutes to an hour for them to soak. Preheat oven to 350. Brush mushrooms with oil and bake for 10 minutes. While mushrooms are cooking, pour tomatoes and wine into warm pan from sausage. 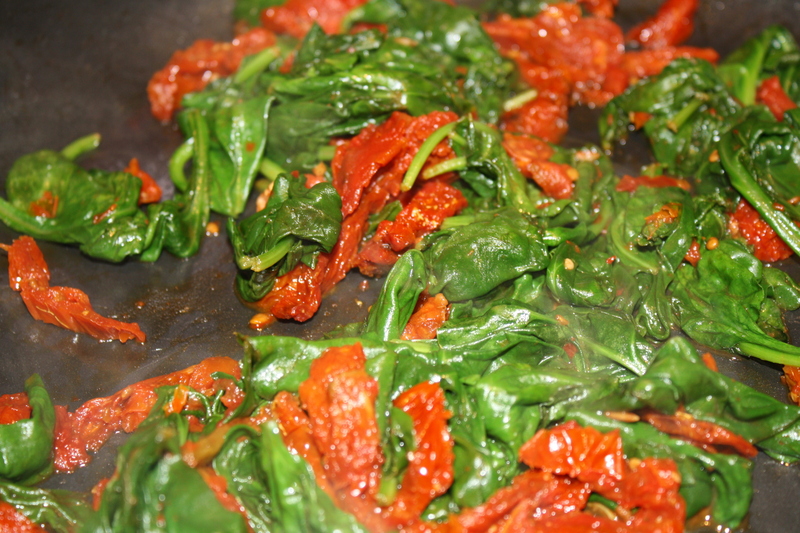 Cook off most of the liquid and then add spinach and wilt. 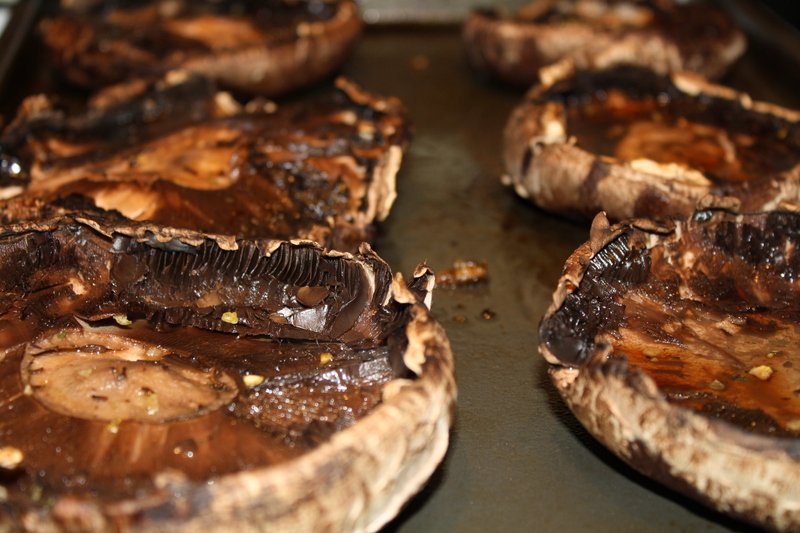 Remove mushrooms from oven. Top as follows: spoonful of pesto, spinach and tomatoes, sausage, sprinkle of mozzarella and finish with feta. 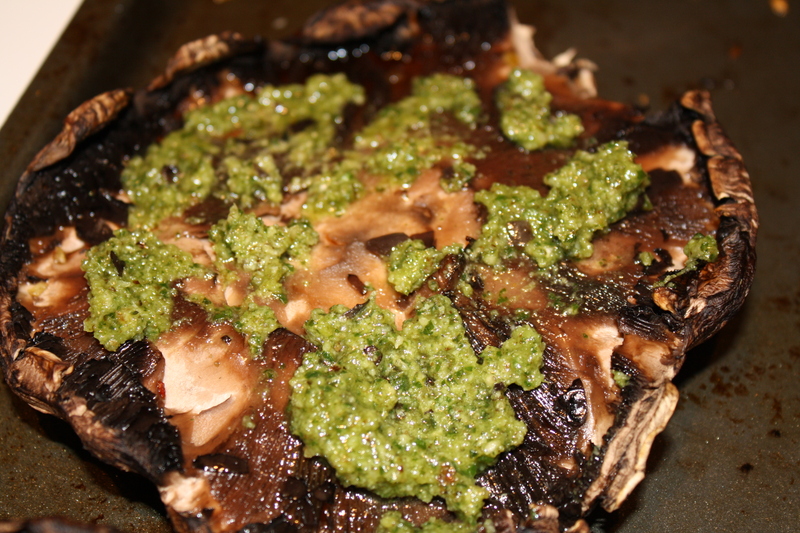 Place mushrooms into oven and turn on broil for 5-7 minutes. Do your monkey mushroom happy dance!